When it comes to historical buildings, there are few with quite so much pedigree as the Tower of London. It has stood through so many years, so much history, that the past is almost literally seeping from its walls. 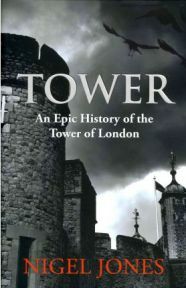 With a long-standing interest history, particularly the Tudor period, Tower by Nigel Jones was definitely a book for me. “An Epic History of the Tower of London” it was subtitled as – perfect, I thought, all this wonderfully fascinating history presented through its relationship to the Tower. Construction began under William the Conqueror in the 1080s, and throughout the centuries the Tower has been a fortress, palace, jail, torture chamber and zoo. It acquired a sinister reputation during the Tudor period when it was used more as a jail and for executions of traitors – notably Anne Boleyn; the last execution took place during the Second World War, and now it is one of the country’s premier tourist attractions. Tower is structured largely chronologically, with only a few chapters focusing on a particular aspect of the Tower rather than the next time period. Examples of these are the sections on the Royal Menagerie and Escapes from the Tower – we learn the story of the menagerie through its whole existence, and the escapes are described chronologically, but within the chapter itself. The opening chapter begins by focusing on the initial construction of the Norman White Tower. The narrative then progresses through time, with an interlude for the chapter on the menagerie, charting the changes to the Tower and to England. However, it was quite early on that I began to suspect this wasn’t the book I had hoped for. Jones writes with an engaging style, and although there are errors (most of which I hope are typos and therefore poor editing, such as giving the wrong century for a date, i.e. 15– instead of 16–), Tower is enjoyable to read. Yet it does not truly read like a history of the Tower of London. While there must be allowances for some “scene-setting” in various places, to give the reader a wider picture of what was going on in the country at any particular time, it was quite early in the book that I began to wonder when the scene-setting was going to end, and the history of the Tower was going to begin. To me it read like a history of England with a bit more of a focus on the Tower’s role than in most general histories – not a specific history of the Tower itself. This view changed in some passages, where it was very much a history of the Tower, but that couldn’t be said for the whole book. Don’t get me wrong, I thoroughly enjoyed reading Tower and would recommend it, but it wasn’t quite what I expected it to be – or what it sold itself to be. I have finished it with greater knowledge of the Tower’s history than I began, but the angle of the book wasn’t quite so focused as I had expected from it. For this reason alone I was disappointed with Tower, but there is nothing else to fault, apart from the occasional error which I took to be a typo.